A large forest fire raging 50 kilometres (30 miles) southwest of Berlin continued to spread early Friday after hundreds of people were evacuated from their homes. The smell of acrid smoke reached as far away as the capital as more than 400 hectares (1,000 acres) of woodland burned outside the city of Potsdam. 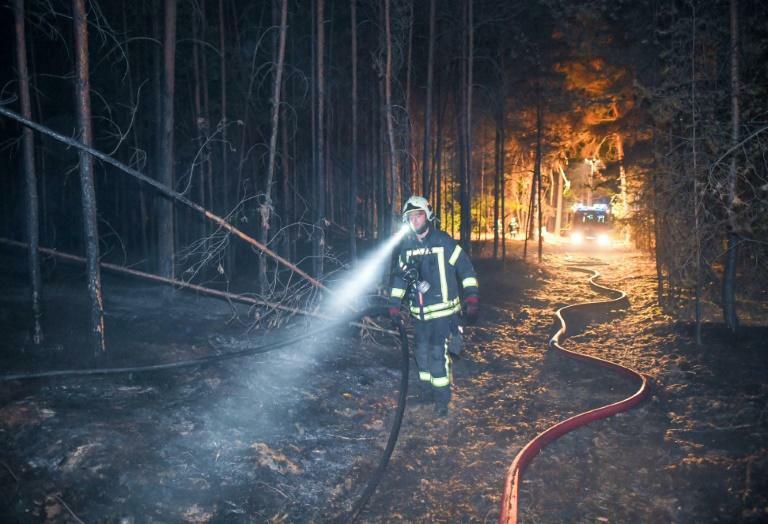 Around 600 people were told to leave their homes in three villages in Brandenburg state late Thursday as about 300 firefighters battled the blaze from the air with water-bombing helicopters. "Our main goal remains to protect the evacuated areas from the flames," local official Christian Stein told DPA news agency. "We haven't been able to push back the fire yet but no building has been affected." Efforts to contain the fire were complicated because the affected terrain is still littered with munitions from World War II, regional emergency response coordinator Michael Knape told public broadcaster RBB. He called the situation "dramatic", saying there had already been small explosions from ordnance buried in the ground. An enduring drought and heatwave have left European rural areas particularly vulnerable to wildfires, which wrought devastation in Greece and Sweden earlier this summer. As the flames came within 100 metres of one of the German villages, residents were told to take only the most essential belongings like medication and documents before fleeing. Emergency hotline operators received hundreds of calls from residents of Berlin saying they could smell smoke. "The entire urban area is now affected. The cause is the large fire in Brandenburg," the Berlin fire brigade tweeted.